If God is dead and nature red in tooth and claw, “what could possibly explain human morality?” That’s the crux of primatologist Frans de Waal’s tenth book. Having long watched bonobos and chimpanzees aid and comfort one another, displaying fairness, friendship, gratitude, and regret, de Waal refuses to view morality either as an imposition from on high or as merely a hypocritical stratagem of selfish genes. Rather, he roots human morals in the rich middle ground of emotion that mediates survival for mammals, securing the advantages of maternal nurturing and group living. He argues that we’re hardwired for empathy, that mirror neurons blur the self/other distinction, and that kindness is pleasurable, not sacrificial. But he also respects the “darker” side: the need for hierarchy to enforce impulse control for social cohesion. God, he suggests, may be a “supernatural supervisor” for mass societies, where face-to-face oversight by alpha tribe members is often lacking. But de Waal is defiantly tolerant of religion, which he finds as natural to humans “as walking or breathing.” It’s dogmatism, religious or atheistic, he can’t abide. Gleevec, or imatinib, was the first drug to “hit cancer at its genetic roots,” striking at a chromosome translocation and its rogue protein product and ushering in the age of targeted molecular therapies with a bang. Ten years after Phase 1 trials of Gleevec, most subjects are still alive and in remission from chronic myelogenous leukemia (CML). 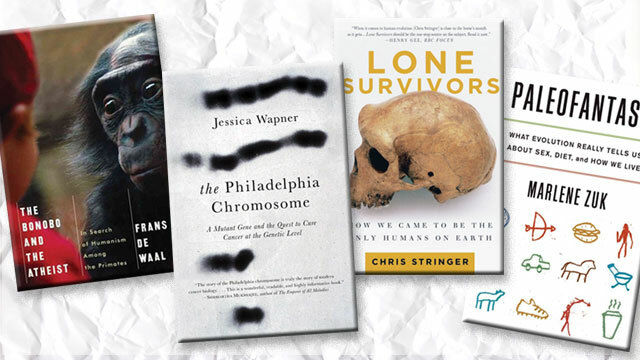 Science journalist Jessica Wapner’s mostly superb debut book chronicles, first, the slow work, technological advances, and stunning serendipity that assembled a “scientific masterpiece” out of converging contributions by some 30 researchers and then, the halting collaboration with industry and government that wrestled the drug to market to save more than 100,000 lives. This second half of the book is a straightforward tale of perseverance through corporate and regulatory thickets, told with fairness to all. But it’s in the basic-science story that Wapner both shines brightest and flickers. Scientists will wince at the occasional inaccuracy (proteins are made “as the DNA helix unwinds during cell reproduction”; tamoxifen blocks “production of estrogen”). Yet the way Wapner repeatedly adds up preceding steps to build to the scientific breakthrough is masterful, making for compulsive, surprisingly emotional reading. Your mom’s advice to “eat your fish, it’s brain food,” may be more than 50,000 years old: a diet high in aquatic resources was a feature and perhaps a driver of fully modern (symbolic, social, linguistic, technological) human behavior. Of similar age, a genetic mutation associated with ADHD may have helped propel newly risk- and novelty-seeking humans out of Africa. Oh, and they may have been wearing shoes. These are among the thrilling, though tentative, revelations in Lone Survivors, Natural History Museum (London) paleoanthropologist Chris Stringer’s frontline report on the evolution of thinking about human evolution. In the past 40 years, technological breakthroughs—DNA sequencing, ice-core sampling, computed tomography and synchrotron scanning of fossils, isotope dating—have unleashed a deluge of new discoveries and data, enabling scientists, including Stringer, to line up fossil, genetic, archaeological, and climatological evidence. As in molecular biology, new information brings new clarity, but also new complexity and confusion, to the human story—and to the reader, who will revel in Stringer’s sharp-focus detail but could have used genealogical charts for guidance through the tangles of both human and theoretical lineages. What’s the 21st century’s mythical golden age? The Pleistocene! Current fads in diet, exercise, and gender generalizations insist we should live and eat like “cavemen,” and call agriculture humanity’s “worst mistake.” Dissidents who view this paleo-nostalgia as suspect or silly have now found their standard-bearer in evolutionary biologist Marlene Zuk. A marvelous explainer, who can translate technicalese into plain English without lapsing into baby talk, Zuk debunks many pop-sci misconceptions, such as the one that says evolution proceeds only glacially slowly, so our Stone Age genes ill fit us for modern life and food. On the contrary, she shows, our very genes reveal that many of us have evolved quite recently to digest milk and grains, and we’re evolving even faster as large populations provide more mutational fodder and more-virulent pathogens to drive selection. Contrary to the caricature of the nuclear “cave family” fed red meat by hunter Dad, evidence suggests that paleo families were extended, roles flexible, and “even the manly Neanderthals” munched carbs. Zuk skewers the delusion that adaptation is (or was) ever perfect, that any product of restless evolution—let alone Homo sapiens—is ever a done deal.